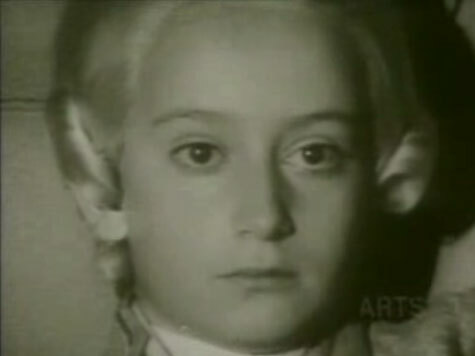 Diego Crovetti as Wolfgang Mozart in "Mozart: Aufzeichnungen einer Jugend"
("Mozart: A Childhood Chronicle"). Image Source: Classic Arts Showcase. Being passionate about Mozart in cinema as an artform, I've sought out every film I could find, whether documentary or drama, and I continue to do so in my quest to become familiar with this medium's interpretations of Mozart's life. I've documented these finds to address Mozart's ongoing relationship with the silver screen as both character and accompaniment. I've certainly discovered some gems along the way, but none more so than Mozart: Aufzeichnungen einer Jugend (Mozart: A Childhood Chronicle), a work which combines the art of cinema with the most authentic script in town: the extant letters themselves. Directed by Klaus Kirschner for German television in 1974 (Kuratorium Junger Deutscher Film, Artfilm Pitt Koch, Bayerischer Rundfunk), this semi-documentary account of Mozart's life consists of the actual letters written by the composer, his family and others, with the contents of these letters being interpreted in re-enactment fashion. Filmed on location in Europe, it covers Mozart's creative life from approximately 1763 to 1776 (three actors represent ages 7, 12 and 20) and is accompanied by his music from this period. The soundtrack was recorded on Mozart's surviving instruments to produce a more authentic sound. Albeit a cinematographic style which looms and laments for lengthy shot durations often utilizing close-ups, nearly to a fault, the resulting scenes are often stunning. This type of approach is especially good for creating psychological and empathetic rapport. For example, in this scene, one can feel Mozart's tender childhood compromise under the isolating, tedious and grueling demands of being on tour as a prodigy in the 18th Century (he traveled 10 years out of his 35 years). Parental exploitation is a prevalent theme in the film. Later in the scene, the words from a letter of an older Mozart are heard which foreshadow his desire for personal and professional emancipation. When I watch this scene and internalize his stoic resignation, I feel profound sadness for Mozart's great sacrifice. I love the film's ability to so unabashedly deliver me to a raw and real understanding of this history instead of one perpetuating a cherubic falsehood. When I watched this film for the first time, one moment in particular stole my heart with what seemed to be unachievable authenticity, perhaps for its connection to one of the only authenticated renderings of Mozart's likeness that has survived to us. Besides the aforementioned scene, other footage of the film doesn't exist online, so I uploaded it. This is exclusive material you won't find anywhere else online! I could only find the film on VHS, and had to convert it to DVD, so it's not the greatest quality, but the patina is part of its charm. The scene depicts Mozart, nearly 14 years old, sitting for the famous Verona portrait (January 6-7, 1770). It was commissioned by Pietro Lugiati and painted by Giambettino Cignaroli or Saverio dalla Rosa, or both in collaboration. An account of Mozart's Verona concert on January 5, dated January 9 and published in the Gazzetta di Mantova on January 12, mentions the portrait: "...and thus to universal admiration, especially among music lovers; among them were the Signori Lugiati who, after enjoying and allowing others to enjoy yet finer proofs of this youth's ability, in the end wished to have him painted from life for a lasting memorial." The Agnus Dei begins as Mozart poses for the artist. His father Leopold watches closely. The narration begins with the words of Lugiati, who commissioned the portrait. When the limitations of Mozart's youth are expressed in this narration, Mozart counters it by demonstrating his prowess and discerning taste for singers. When the narration continues with Lugiati considering the idea of admiration for someone so young in an almost derogatory tone, Mozart interrupts and asserts his authority on the subject again, giving a direct look to the artist that startles him. It's as if the artist is Lugiati himself. I thought this was a brilliant moment of transference and interpretation of the letters in the script. The scene also captures the fact that Mozart was very confident in his abilities and as time went on, he grew increasingly intolerable of being assessed and criticized as a musical servant by those with undeserving power over his genius. All films about Mozart are not created equal, but this one certainly stands out on its own accord for its creative re-imagining of the letters and its authentic soundtrack, rendering an historically informed work that is both poignantly insightful and entertaining.